Gallery artist Robert D. Cocke will be represented in a major exhibition at the Tucson Museum of Art. The show, titled "Into the Night," examines the long tradition of the nocturne in art, and the various ways that artists consider the enigmatic notion of the night. More than 65 artists, working in a variety of different media, will be included in the exhibition, which was curated by TMA Chief Curator Julie Sasse. Cocke's work is an oil on panel painting titled "The Key-- Hotel Capricorn." Exhibition dates are February 27-- June 10, 2016. “Six West”, a new oil on canvas by Robert Cocke is an otherworldly landscape that chronicles his fascination with the environment. 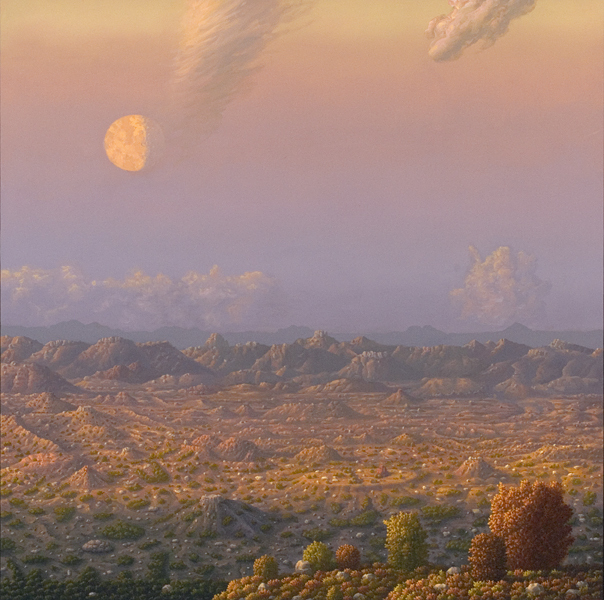 In this 36×36 inch painting, the southwestern desert seems to exist in a science fiction world. Highly detailed, and carefully painted, the landscape is filled with mounds and dotted with rocks. Whether created by man or natural elements, the artist leaves to our imagination. Curious plants seem to thrive in the harsh climate while striking cloud formations float on the horizon and above, casting shadows on this beautiful but mysterious land under the benevolent gaze of an eclipsing moon. Please click to see more paintings by Robert Cocke.